A long-range plan called Envision Madison is under way in Madison County to ensure the community remains economically viable while maintaining its quality of life as growth continues. City planners and government leaders – and entrepreneurs looking for the next business idea – are hunting for strategies to facilitate continued natural growth. Fortunately there are a few statistical tools that can aid the process. Location quotients can quickly highlight differences in employment concentrations by taking the percentage of total employment an industry has in the targeted region and dividing it by the same industry’s percentage of total employment in another region. If the resulting ratio is less than 1, the targeted area might be importing products in that industry, creating a gap or leakage in the local economy. Location quotients below 1 can also be the result of lower local demand for products in that industry. Lower location quotients can be explained by neighboring counties satisfying local demands on a regional level. Car dealerships and other retailers are good examples of sectors that often have low location quotients in rural counties because they tend to locate in more urban settings. Location quotients greater than 1 can indicate areas of strength, specialization and exporting ability. In all cases, good qualitative data is useful to explain location quotient results. By using Madison County as the base for location quotient comparisons, other counties with similar characteristics can highlight what industries Madison is lacking. In Madison County’s case there are a number of counties in the western region that could be used to assess current differences and prospects for the future. Multiple counties were selected and compared to reveal what Madison might look like after decades of future growth. Many of these communities are anchored by universities and are close to national parks. Similar to Madison, many are also close to major transportation routes like Interstate 15 and U.S. Highway 20. When Madison County was compared to these other counties some consistent shortfalls were revealed. Madison County was used as the base area for comparison so location quotients were calculated for the 14 targeted counties in the study. The targeted counties’ location quotients for each industry were averaged to create a single location quotient. This average location quotient revealed how much more or less concentrated the other counties were in specific industry employment compared to Madison. Based on these results, five target industries were identified for closer inspection. These five industries had employment concentrations – or location quotients – of 1.3 times to 2.8 compared to Madison. The target industries were leisure and hospitality, manufacturing, construction, other services and information. If Madison’s economic makeup was changed to match the average of the comparison counties, nearly 1,600 jobs would be added in the five target industries. This model would also suggest nearly 1,700 jobs would be shed in industries like wholesale trade, professional and business services, private education and health services. But this suggestion should be taken very lightly. Potato production is a significant reason for Madison’s relatively high concentration of wholesale trade jobs. The local university is responsible for the high concentration of education jobs. And the high concentration of professional and business service jobs is probably caused by a relatively large number of residents and students working at call centers. All of these industries have a reason for being in Madison County regardless of activity in other sectors. 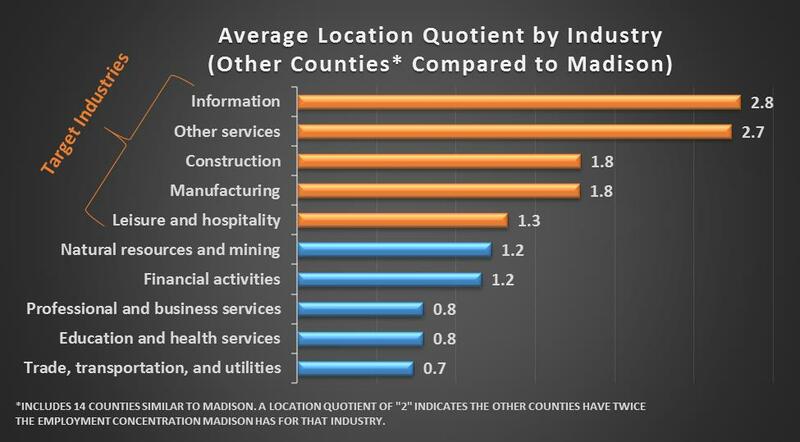 A closer look at how individual counties matched up against Madison provides some perspective on these target industries. Since Madison County was used as the base industry, its location quotient would be equal to 1 for all industries. Although the location quotient for the comparison counties is very high, Madison County might not need information industry jobs locally. Many information related jobs can be fulfilled regionally and can be taken advantage of through technology. But the presence of talented university graduates could attract information industry related businesses. Many of the comparison counties were successful at attracting these types of businesses. Some of the comparison counties were remarkably more concentrated with information jobs than Madison. Utah County, Utah, was 8.5 times more concentrated than Madison. Only Jefferson County, Idaho, and Polk County, Ore., were less concentrated. On average the comparison counties were 2.8 times more concentrated. The other services industry is broad to say the least. The wide range of businesses in this category made detailed comparisons for sub-level industries difficult. Disclosure restrictions limited actual employment number comparisons to repair and maintenance businesses and personal and laundry care businesses. The larger location quotients for the comparison counties were found in repair and maintenance where the average location quotient was 2.3 while personal care and laundry services was 1.3. The average location quotient for the comparison counties was 2.7. 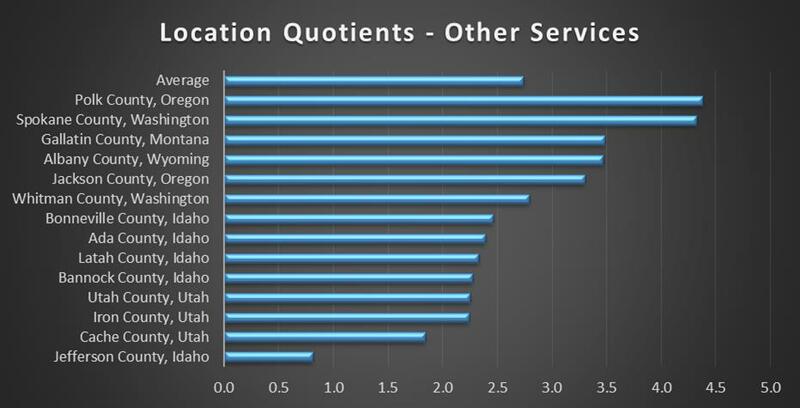 Only Jefferson County, Idaho, had a concentration for other services below 1 at 0.8. Madison County grew significantly in recent years. Large construction projects at BYU-Idaho and the local hospital provided hundreds of construction jobs. But industry insiders suggest that the contractors and many of the workers came from outside the county and even outside the state. The ever-growing student population in Rexburg is fueling multiple large scale student housing projects. But these projects are often awarded to contractors from outside the county and region. The average location quotient for the comparison counties was 1.8. In previous industries Jefferson County, Idaho, ranked below Madison for employment concentration. But for construction, Jefferson outranked the other 13 comparison counties with a location quotient of 3.3. No other county had a construction job concentration below Madison. This outcome further establishes the case for more employment from Madison County based on construction businesses. The ability to filter manufacturing into smaller categories was also hindered by disclosure restrictions. But there was a significant shortfall in fabricated metal product manufacturing. That industry sector alone had an average location quotient of 8.5 for the comparison counties. In 2012, Madison County only had 11 jobs in the fabricated metal product manufacturing. The overall manufacturing location quotient was 1.8 with 729 jobs. Discovering other employment gaps related to manufacturing will require information from the industry. Four counties had lower manufacturing employment concentrations than Madison. The Envision Madison process could identify where these manufacturing gaps exist. Most of Madison’s deficiency in leisure and hospitality businesses is in hotels and restaurants. The average accommodation location quotient for the comparison counties was 2.4 while food services and drinking places was 1.3. In recent years the need for student housing was so great that even hotels were being converted to apartment complexes so that student housing might be competing – to a large degree – for the available land and labor to build hotels. Utah and Cache counties in Utah and Jefferson County, Idaho, all had lower leisure and hospitality employment concentrations than Madison. Large universities in Cache and Utah counties might be a contributing factor for artificially low location quotients. The universities often provide large-scale services that could compete with privately owned establishments. University employment is in the education sector even though these services are not directly related to education. The question is what will Madison County look like in 2050? Even though Gallatin and Madison share many characteristics, it is hard to say Madison will develop the same industries and economy that Gallatin currently has. But combining the other 13 comparison counties could provide some insight into Madison County’s future. Madison County had an employment-to-population ratio of 28 percent in 2012 while Gallatin was 40 percent. 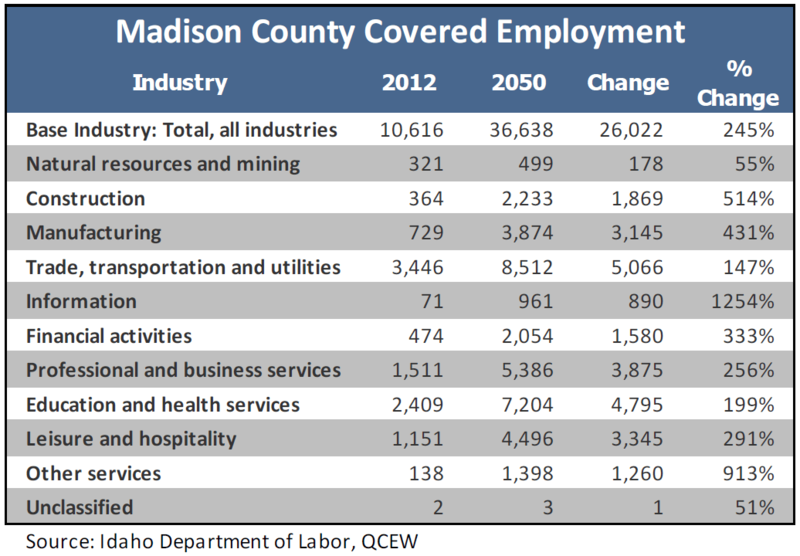 If Madison’s future employment-to-population ratio is anything like the current ratio in Gallatin County, Madison will have a total covered employment of 36,638 by 2050. After applying the new employment to population ratio and current comparison counties’ employment concentrations to Madison County, the Madison economy could add over 26,000 jobs by 2050 with significant nominal growth in trade, transportation and utility employment. The greatest growth in percentage terms would be in information, others services, construction and manufacturing. More information regarding location quotients can be found in the Quarterly Census of Employment and Wages, using the Location Quotient Calculator.